In this article we can explore the creation of Document Library through code. Here we are using existing Document Templates inside SharePoint to create a new document library. Create a new console application and name it as DocLibCreation. Make sure you change the target framework to .Net 3.5. Now run the application and you can see the new Document Library created inside SharePoint. Now we can try uploading a document to the above library programmatically. Use the following code to upload an excel file. Make sure the application bin folder contains a file named sample.xlsx. After running the program, you can see that the file is created in the bin folder. In this article we have the creation of document library through code. Please note that using the Document Type we can create different types of document library. 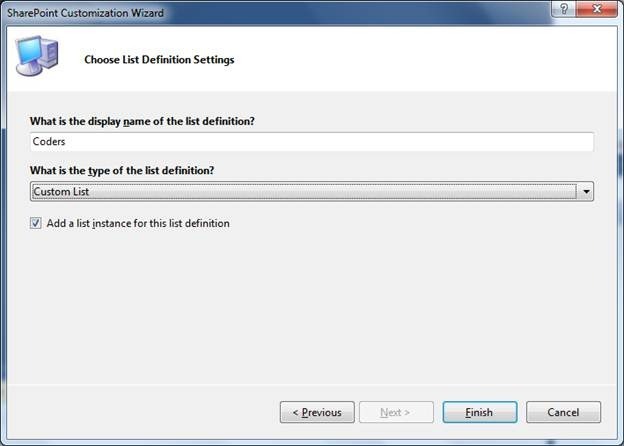 In this article we can explore the List Definition creation using Visual Studio. 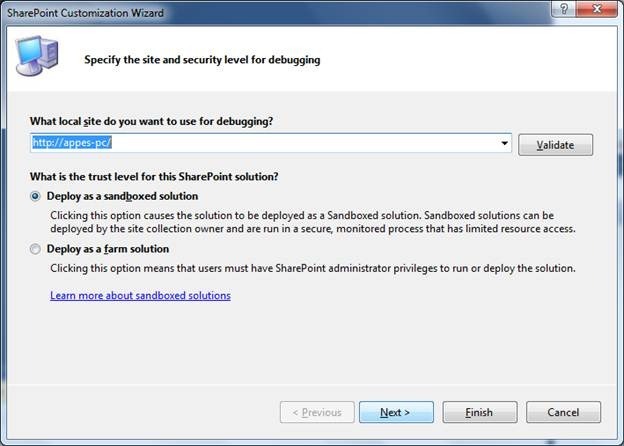 Please note that the same can be achieved through SharePoint Designer as well. For starting use the List Definition project inside New Project dialog. Enter the name as Coders. Select the site from the wizard as shown below. Choose Custom List in the next step. Now click the Build button and on succeed, right click the Project and click Deploy. If no error messages are there, the Deployment succeeded and you can see the new List inside SharePoint. On clicking the Coders list you can see the new list opened in SharePoint. Now we need to add a custom column to the List Definition. Our column is of Single line and name as CoderName. Following are the activities included in the Column Creation. · Specify the properties like ID (GUID), Name etc. Inside the ViewFields section of the second View, add the following FieldRef node. The new CoderName property is visible now. This concludes our List creation using Visual Studio. For adding more columns, use the Schema.xml file. 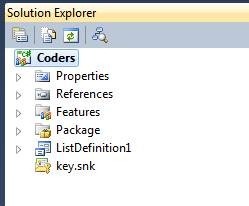 In this article we have explored the List Definition creation using Visual Studio. The attached source code contains the example we discussed. You can try building and deploying it. For proceeding with we need to create a List named Tasks using template Tasks. Now create a new SharePoint Console Application project inside Visual Studio. Make sure you changed the Application Target Framework to .Net 3.5 version. 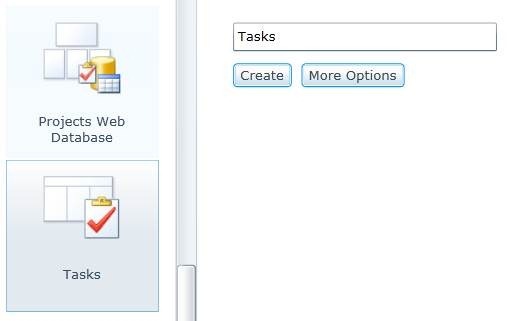 Now you can check the Tasks list inside SharePoint and you can see the new item there. For editing an existing Task use the following code. Here we are changing the first item Title and Description. For deleting an item use the following code. Now you can go back to SharePoint and see that the item was deleted. In this article we have experimented List manipulations Add, Edit, Delete through code. In real life we will be needed to automate List manipulations and programming will be a help in this regard. In this article we can explore some of the advanced programming areas. LINQ to SharePoint is a new feature of SharePoint 2010. LINQ stands for Language Integrated Query which is a part of .NET Language. The aim of LINQ is to support different data sources using the same Typed Query Syntax. Presently it supports Objects, Datasets, SQL, Entities, XML etc. You might have noted that the previous List Programming examples did not used proper column name access. LINQ allows us to access the List in a Typed manner. Adding more clarity we can access the list items based on the column names which we usually do with the databases. As we will be creating custom lists having custom column names, we need to generate the Entity Model. The SPMetal.exe is the tool which helps in generating the Model classes. Although we can create the Model classes manually, it will be a tedious job and error prone. Using SPMetal would be the right approach to model classes. Now we can generate the Entity Model for the above List. Wait for a while and you will be ready with the new file. Open the file SiteEntities and you can see the Manager class is contained inside. Create a new SharePoint > 2010 > Console Application (targeting .Net 3.5 framework) and add the SiteEntities.cs file into it. Note: You can use LINQ or Lambda Expression to do the query. In the above example I have used Lambda. On executing the application you can see the following results. 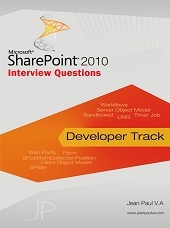 This concludes our Read, Insert, Update, Delete operations using LINQ to SharePoint. Hope the topics are understood by the reader. 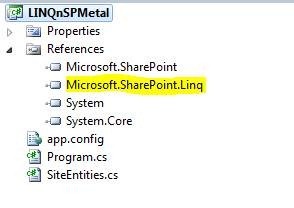 In this article we have explored LINQ and SPMetal tool. This information is necessary in the real world programming scenarios. The attachment contains the source code we discussed.